We are a leading organization engaged in providing Inserts News Paper Advertising services. 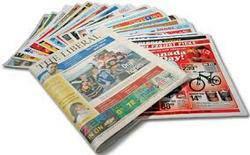 These services involve the use of newspaper inserts as a medium of advertisement. These services involve the delivery of paper inserts that advertise the products and services offered by a company. These inserts are delivered along with the daily news paper so that people reading the paper can also go through them. Established in year 2011, we, Admanager Advertising Pvt. Ltd., are a highly reputed Service provider of highly efficient Auto Branding, Car Shade Advertisement, Cab Advertisement, Truck Branding, Media Advertisement, Standee Advertising, Canopy Advertising and many more. These services are rendered by our team of highly experienced service professionals within the client’s specified time and budget specifications. These services are highly demanded by a firm to ensure the increased visibility of their offered range of products and services. Our competent professionals render these services in the most efficient manner in order to ensure the fulfillment of the expectations of the clients. The services provided by us are aesthetically appealing. These ensure maximum visibility and publicity for a brand name. The demand for the services offered by us is high because of their economical pricing. These services employ the use of latest printing technology and are rendered in a streamlined manner in compliance with industrial quality standards. Admanager is the leading automotive advertisement company dedicated to grow the business of its clients with its marketing skills and advertisement services . we are the specialized in the concept of advertising through auto-rickshaws , cabs , buses and other vehicles.